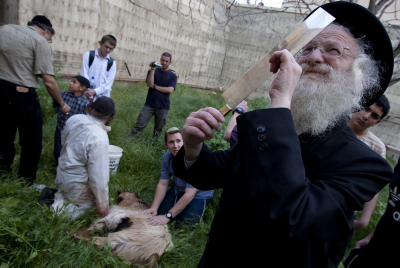 Jerusalem - Right-wing activists Yehuda Glick and Noam Federman were arrested Sunday on suspicion of planning to sacrifice young goats near the Temple Mount. Glick was detained near Jaffa Gate in Jerusalem’s Old City and was taken in for questioning by the police. The young goat found in his possession was handed over to the Wildlife Supervision Department in the Agriculture Ministry. Federman was detained for questioning on suspicion of aiding Glick, and was later released. Shortly afterwards, Federman was arrested once again near Dung Gate in possession of another young goat in his car. Before the second time he was detained, Federman told Ynet that the police had released him because they thought a sacrifice could be only be offered with a sheep. “I come here to observe the holiday mitzvot. It’s a shame and a disgrace that the police are trying to stop Jews from going up to the Temple Mount and offering a sacrifice for the Passover holiday,” he said. The police suspected that the two were planning to take the young goat from the Hurva synagogue towards the Temple Mount and create a provocation. A group of girls was also said to be making its way to the Mount with another young goat. Does anyone doubt that these very same secular police will issue an arrest warrant against the Righteous Moshiach Tzidkeinu who will be going to the Har Habayis to rebuild the Beis Hamikdash and brink Korbonos? It is true that now is not the time to bring Korbonos, and it is true that we are still waiting for the arrival of Melech Hamoshiach to rebuild the Beis Hamikdash (possibly even today) but that is not the motivation of the secular Israeli Police who will surely do the identical SAME to the real and righteous Moshiach too. Shtusim vehavalim sir! When Moshiach comes everyone will do Teshuvah and I'm sure those who were formerly irreligious will be leading the pack and will be the first to the Har Habayis to bring a Korban to Hashem! Why are there so many "Meshiguim" in Israel? Except, they'll be powerless against Moshiach and will even participate and help Moshiach in controlling the crowds. Why isn't this shochet umaaleh bachutz which is 2 issurei koreis? Good! Throw them in jail and do it infront of al jazeera and other arab media sources! We can NO LONGER tolerate these extremists troublemakers inciting the hatred of the nations surrounding us! On this day when our forefathers sacrificed a lamb it is ironic that we are today ascribed as being a lamb surrounded by wolfs who wish to tear us asunder! Why are we upsetting the wolves? We need to wait and be patient for HKBH to send messiach! Enough with the waiting, we've waited 2000 plus years. Enough is enough. What's the waiting for, so there won't be any frum Jews left c"v.
Should the victims of the Holocaust have waited patiently in the camps if they had a chance to make a run for it? If these jokers are so frum that they want to bring korbonos, why aren't they frum enough to realize that they are NOT ALLOWED to bring korbonos while the Beis Hamikdosh is not standing and that they are NOT ALLOWED on the Har Habayis because they are tumah? Where do they get these people??? It has been less than 2000 years since the destruction of the second Beis Hamikdosh. To Teshuvah and maybe Moshiach will come going on the har Habies and provoking the Arabs and making a chilul Hashem and putting jewish lives at risk won't help the situation. We are waiting until Moshiach comes.....like we are supposed to. We can NOT bring a korbon now, no matter how many animals you shecht. what kind of stupid insensitive comment was that?!! Think about the absurd analogy you are making. Your making a big mistake. The reason the "secular" police are stopping them is not because they're anti-religious (although that might be true). The reason, as clearly stated in the article is that it would cause a provocation (even though that provocation would be hyped up by the Arabs). Proof in point, if they decided to bring an animal to the Churva shul to offer as a korbon the police wouldn't stop them. You don't need a Bais Hamikdosh but you need the makom hamizbeach and without that it's schutei chutz which is an issur kareis. “ If these jokers are so frum that they want to bring korbonos, why aren't they frum enough to realize that they are NOT ALLOWED to bring korbonos while the Beis Hamikdosh is not standing and that they are NOT ALLOWED on the Har Habayis because they are tumah? Tumah Hutra Betzibur! where does it say that you ned a beis hamikdosh to bring a korbon pesach? It's a old machlokes btw the gedolim. (a) Where does it say that you need a Beis HaMikdash to bring Korbonos? You need to know where the Makom HaMizbe'ach is to do the proper Zreika (or, in the case of the Korban Pesach, shficha), but there is NO REQUIREMENT for the Beis HaMikdash to actually be built in order to bring a Korban. (b) Did you ever hear of the Halacha of "Tuma Hutra B'Tzibur"??? In other words, if Rov of Klal Yisrael is Tameh, Korbanos can be brought B'Tuma (though going on to the Har HaBayis B'Tuma for no good reason is still not allowed). While the political wisdom of trying to bring a Korban Pesach is questionable, there are definite Halachic opinions (including, I believe, the Rambam) that permit bringing the Korban. This is all good and fine except that these people do not accept the gemorah that says that at the Churban Hashem swore 3 oaths 'Three Oaths'. The Talmud, in Ketubot 111a, mentions that the Jewish people have been bound by three oaths: 1) not to ascend to Eretz Yisrael (the Land of Israel) as a group using force; 2) not to rebel against the nations of the world; and 3) that the nations of the world would not persecute the nation of Israel excessively. Though the goyim broke their oath , we still do not have the right to provoke them with such acts when it will endanger other Jews. To 5t resident, Berl; - I too do not believe it is a good idea to bring a korban pesach becuase of the political situation - but the halacha is that if you do not bring a korban pesach - you are chayav koreis - you just need to know mokom hamizbeach - tooma hutra bitzibur - and they are not trying to shecht kodshim bachootz. And Berl the three shavuos are not halacha and not brought down by the shulchan aruch. I heard in the name of Rav Moshe Feinstein in response to three shavuos that we do not pasken halacha from agada. Rav Kook, Rav Herzog and the majority of gedolei yisroel had no problem with this. Many stated that the third shavua was not kept by the goyim - so all of them are NOT applicable anymore (if they were ever applicable). Israel was founded with the permission of the UN any way. mashiach is not going to MAKE anyone do tshuva, he's going to enlighten us with the true philosophy within theology. the ones who it will be the most difficult to change are NOT the secular jews!! they will do tshuva when they see the words of the neviim are really true, the ones who will be difficult are the people who ALREADY believe that they're on the right path when in fact their facing the other way. the ultra religious jews need the most help to see the truth.